These “Lazy Cabbage Rolls” are probably the EASIEST alternative to stuffed cabbage rolls that Ukrainians or Russians can make. It’s all done in ONE pan, no pre-cooking or sautéing what so ever. Super easy and delicious tasting cabbage rolls minus all the extra labor and rolling! I found this recipe from svetasrecipes.com. There is no need to pre-cook the rice or saute anything in this dish as everything is literally combined and baked to tenderness, easy right? Now don’t get me wrong the rolling version is delicious but can be very time-consuming. If you’re looking for an easier alternative to prepping and want to satisfy that stuffed cabbage craving, then definitely give these a try! 1. 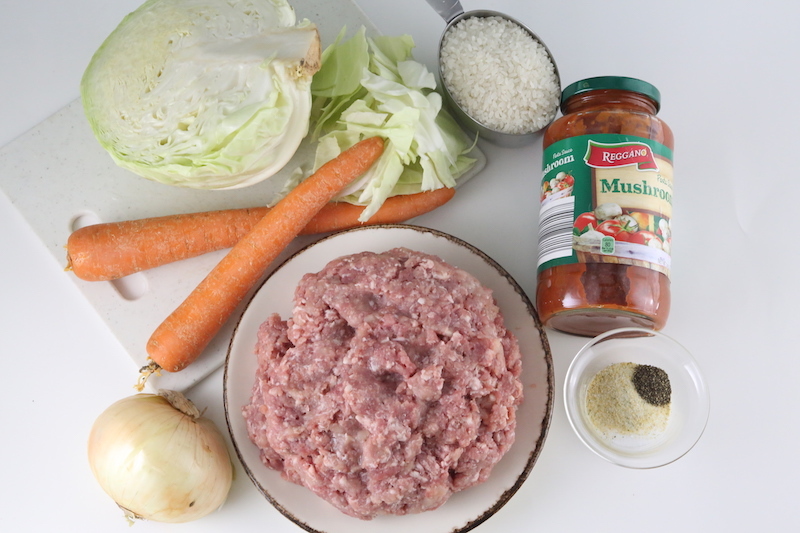 Place the cabbage, ground meat, raw rice, carrots, and onion into a large disposable baking pan. 2. Add the diluted tomato sauce, olive oil, and spices. Mix everything thoroughly. 3. Bake covered in a 400 degree F oven for 30 minutes then reduce temperature to 350 degrees F and continue to bake for two more hours. These "Lazy Cabbage Rolls" are probably the EASIEST alternative to stuffed cabbage rolls that Ukrainians or Russians can make. It's all done in ONE pan, no pre-cooking or sautéing what so ever. Super easy and delicious tasting cabbage rolls minus all the extra labor and rolling! 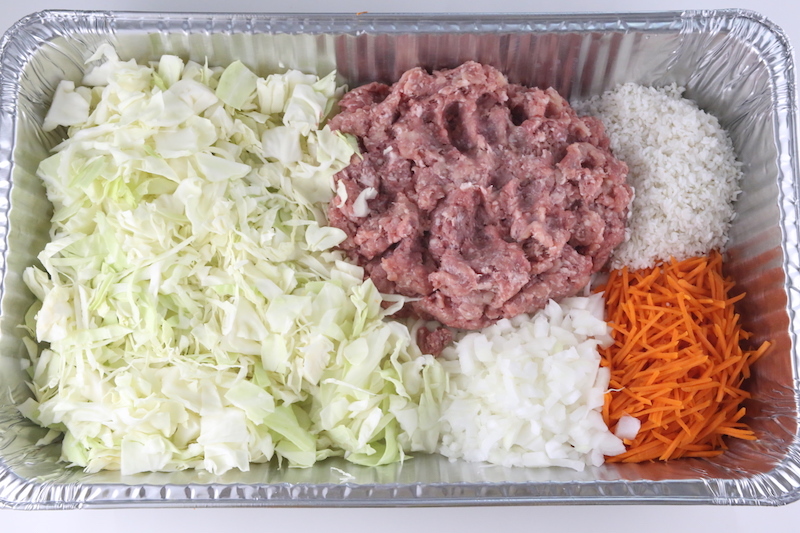 Place the cabbage, ground meat, raw rice, carrots, and onion into a large disposable baking pan. Add the diluted tomato sauce, olive oil, and spices. Mix everything thoroughly. Bake covered in a 400 degree F oven for 30 minutes then reduce temperature to 350 degrees F and continue to bake for two more hours. I tried this recipe before and it’s so good and best thing super fast.. after several months I finally found this recipe again. Thank u for making our mom lives easier. Wow it’s that easy??? Perfect! What if I cut the recipe in half? Will it still make a good amount? You could but keep in mind that the cabbage does cook down once stewed so it may not appear as full after baking. Alyona, Thank you for sharing your awesome recipes. I”ve made several and they all turned out very delicious. My family doesn’t like cabbage rolls, but likes the lazy cabbage rolls. Yes, I know, go figure. I like your spin on this recipe, bake instead of frying. I will be trying this soon. Thank you!